Before I provide the recipe, let me give you fair warning: this is real candy making. 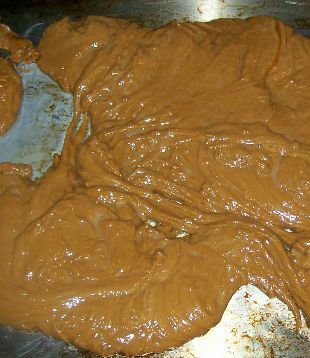 This isn’t like the Easy Peasy Fudge recipe I shared a few days ago. This one requires a candy thermometer or a candy-making expert with a glass of ice water and intimate knowledge of “hard crack.” It takes time and patience and a strong arm to stir. It can be very helpful, maybe even necessary, to have two people for spreading it onto the pan after cooking. I promise it’s well worth the effort, though. I started making peanut butter hard candy when I was about 13. If I could do it then, you can do it now. So without further ado…. Stir together sugar, corn syrup, and water in a large, heavy-bottomed pot. Heat over medium heat until mixture boils. 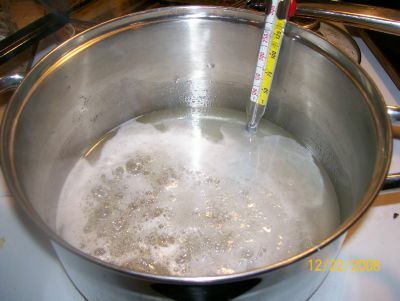 Place your candy thermometer into the mixture and continue boiling until it reaches the “hard crack” stage (295 to 310 degrees F). While mixture boils (and well before it reaches the hard crack stage), measure peanut butter into a large bowl. Pour boiled syrup mixture over peanut butter and stir very well. Work fast. (This is where it helps to have two people for stirring.) Turn onto a baking sheet or platter. Cut while still hot. That’s it! Not too complicated, right? Don’t be afraid to give it a try, especially if you love peanut butter as much as I do. Making peanut butter hard candy is definitely easier than making caramels (which I tried and scorched three times in two weeks). Be brave! – go try to make some peanut butter hard candy and let me know how it turns out. I’ve never heard it referred to as peanut butter brittle. It’s actually a different result than brittle….not as thin or, well, brittle. It won’t “snap” like brittle does. But I do eat pb hard candy and any type of brittle until I’m thoroughly sick, so they do have that in common. I’d love to hear your thoughts after you make it! Great recipe! And your son, at least I think that’s one of your sons in the background, is so adorable. Thanks, Robby! I was wondering if anyone would notice him. His name’s Robert, and we call him Robby a lot so it’s appropriate that you saw him first. :) He turned a year old a couple weeks ago, and we don’t share our candy with him, wahahaha! 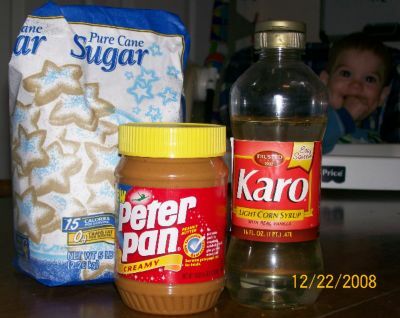 i tried this once but stirred the peanut butter and sugar mixture for too long but it did not turn out. I did it again today, corrected my mistake, and it turned out great. Tastes kinda like the middle of a Butterfinger or 5th avenue bar. Thanks! Hi, Josh. I’m glad you tried the peanut butter hard candy again and glad to hear it turned out good for you! It is easy to mess up if you don’t watch the thermometer closely enough. I cooked a batch just TWO degrees above hard crack and, ugh, it had a slightly burnt flavor and we couldn’t eat it. You’re right that it tastes similar to the middle of a Butterfinger. I’d never thought of that before! Just curious, how did you discover this recipe? That adorable child had to be Robert, he is a perfect cutie! this turned out to taste like bad fudge. what did we do wrong? This is an excellent recipe. It was such a hit for not only my family, but all of my friends who gave it a taste. It reminded me of the inside of a Butterfinger bar, sans the mockolate coating. You just stirred for too long, that is what i did the first time i made it. You want to mix it as quick as possible, and as soon as you think the peanut butter is decently incorporated into to corn syrup you want to pour it onto the sheet. You should not be stirring for longer than 30 minutes. I tried this recipe last night and it was wonderfu. I warmed up the peanut butter so that when Icombined it with the sugar syrup it didn’t harden right away. I poured it on to a marble slab and rolled it to an even thickness with a silicone rolling pin. I quickly cut it into pieces and after it cooled dipped the pieces in tempered chocolate. It tasted just like a See’s P-nut crunch. Thanks so much for sharing this recipe. This stuff is AWESOME. I can’t say enough good things about it, and I’m not even a huge fan of peanut butter. The texture is indescribable…kind of stringy and crispy and grainy at the same time. I sprinkled mine with a little salt while it was still warm and cut it into squares with a pizza cutter as soon as I poured it out. I put each piece on a cookie sheet and drizzled each with chocolate ( I didn’t have enough around to dip each piece). I make hard candy all of the time and will definitely make this again!!! Thanks so much for the recipe! I tried this recipe and it turned out with a kinda grainy texture. I was hoping for a smooth recipe that I could turn into peanut butter flavored lollipops. Is that suitable with this recipe, or did I do something wrong? The taste was divine and the kids gobbled it up. Just wondering if there is such a candy as the one I am looking for. My favorite candy is a peanut butter pillow which has a thin ribbon candy coating and a peanut butter candy filling. I just tried your recipe and it came out very well, taste great but mine does not look to great. I would love to see a picture of your finished candy. I will next time pour the syrup onto the peanut butter because it became like a big ball and hard to spread. As the temp gets close to hard crack stage it rises quickly. I poured on to a marble slab and it took awhile to set up. Great recipe, thanks and will try again maybe today. It taste wonderful!